My mother was a great influence in my love of dolls. It was much later in her life that we decided we were going to start her doll collection up again by traveling to as many places together as we could to collect them. After returning from a trip she had wanted to make for a long time, she found that she had cancer. She died within 6 months, so in her memory, I decided to honor her by building that doll collection. My mother had also cursed me by saying “Don’t buy what you can make yourself.” Needless to say, I was sent on the adventure to learn everything I could about doll making. Having an Art Degree from Montana didn’t hurt but still it didn’t give me the exposure to the type of doll making I wanted to do. Being a mother of small boys at the time also didn’t give me a lot of free time to learn. One time in particular I remember running into a ceramic shop where they were teaching doll classes and asking the owner to teach me all she could as I had a husband and three boys sitting out in the car. She was great and she sent me home with green ware and I bought my first kiln. This is also where I grew to love the feel of porcelain. The softness of the clay, the glow of the translucency, and the freedom of the painting process had me hooked. For a couple of years I struggled on my own. Learning, tossing away, and building a relationship with the porcelain. Then I decided I wanted to share this adventure and placed an ad to see if anyone wanted to share this love with me. I started out with four ladies, but over the next three years I took the group out of my home and created a doll shop. 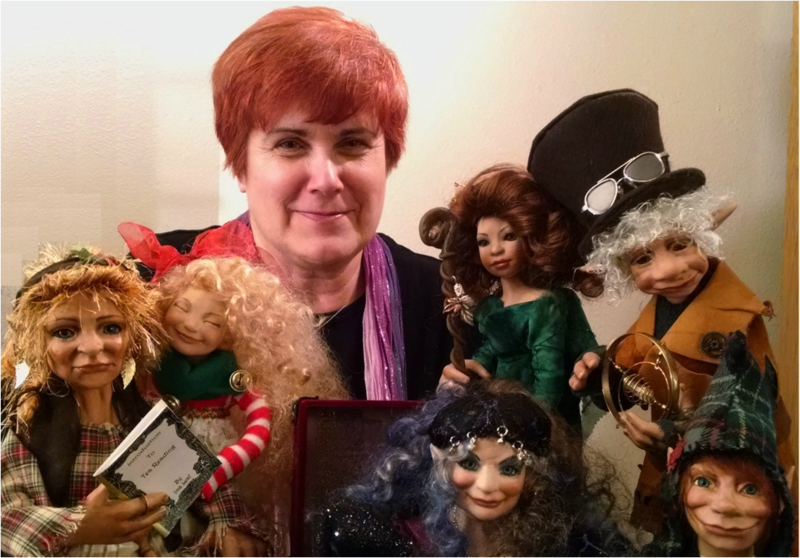 I was teaching 60 people a week and traveling over 100 miles once a week to share the fun and excitement of doll making. Life changes and as such I have moved my business not once but thrice across the state of Montana ending up in Alaska and then back to Montana due to my husband’s career changes. Now I live in two worlds getting to travel to and from Montana to Alaska. I have met more people than I have ever thought to meet through this medium of doll making. But I have also realized the desire for those to make their own dolls was changing, so 10 years ago I decided to take a new path and learn how to sculpt my own one-of-a-kind dolls. Again it continues to be an adventure filled with lessons and challenges but slowly I have developed my own style with my magical characters and their touch of whimsy.